Fonts are the most important part that we often use on smartphones. Every time we type or read of course will be facing different font characters. So here are some Best font changer apps for android with root and without root support. Smartphones Android circulating in the market until now has a feature of a different font, that can be directly changed or there is also a need for root access to change it. Fonts changing app in Android is generally a standard, no unique characteristics. This is what makes the user feel bored and we really want to change it to look not bored. The default fonts on the Android smartphone, like Samsung, Lenovo, Asus, Xiomi, Smartfreen, LG, HTC, or others have different shapes or styles, but usually, the fonts follow from the version of the Android OS itself. On this occasion, I will review Best Font Changer Apps On Android Without Root And With Root. There are many font applications that you can use for free. Take a quick look at the font changing app below. 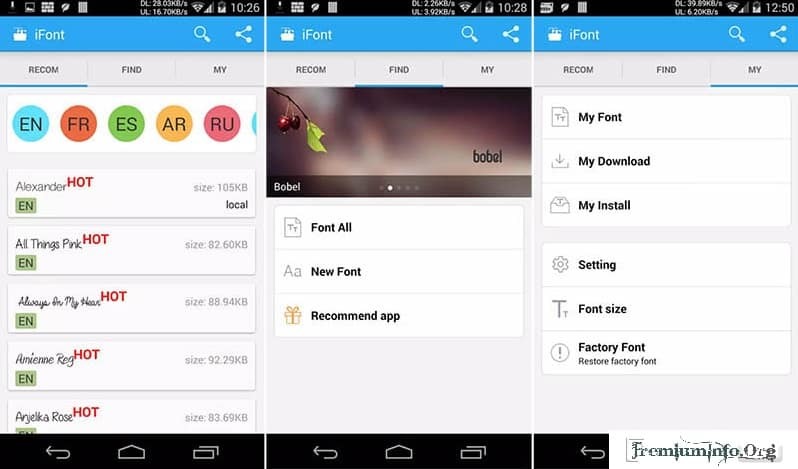 The first font changer application for android is iFont made by developers diyun. This application has a very interesting advantage and different from other font applications. Because you don’t need root to install this font app. Simply Download from the Google Play Store and Install. Then you can change all the system fonts as your wish, even you can also shrink or enlarge the font. The iFont application is compatible with Samsung brand smartphones like Galaxy S3, or Galaxy S4. But for other smartphones be like Xiomi, HTC, Sony, or others also supported mostly. If any problem occurs while using the iFont App without root, then it would be better if you Root first, because the Root Application will be more optimal. Interested in trying, a free download through the Google Play Store. 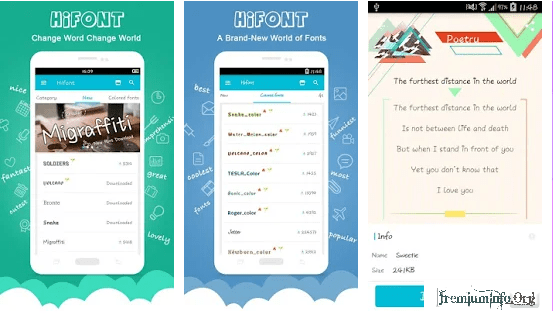 Hifont is a free and best font changer application for android smartphone and tablet. With the Hifont app, you can easily change the font shape as you like. There are hundreds of free, coolest, and stylish fonts that you can apply to your android phone so that your phone looks more unique and stylish. Uniquely, you can change the font color that is usually a white color you can change into colorful as you wish. Hifont application is very supportive on Samsung phones, especially on Galaxy version S3, S4, S5, Note, Note ll, Note lll, and so on (No Root). For other android phones brands such as HTC, Motorola, Lenovo, Huawei, and Nokia X require Root access to use Hifont applications. Download the free Hifont app through the Google Play Store. 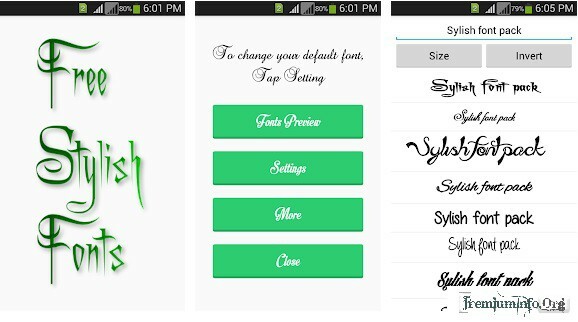 Stylish Fonts is the best Android font changer application you can use for free. This app provides hundreds of free fonts with a wide selection of cool, unique, and beautiful fonts. This App is NOT sponsored, endorsed, or affiliated with Monotype Imaging, Inc, the owner of the FlipFont trademark and technology. Font Player has full support on Samsung phones including Galaxy S3, S4, Note 2, Note 3, and others (without Root). For other android phones such as HTC, Motorola, Lenovo, Huawei and other mobile phones require Root access to install this application. The next font changer apps are called FlipFont. There are 6 packs of pencil fonts that you can use for free. This app is specifically designed for Samsung Galaxy users on all OS types and versions. The user interface of this app is very interesting, you can personalize on all the fonts you want to try. Relax, this app works without Root access. So you do not have to bother doing root on your android phone. Download the free FlipFont app through the Google Play Store. The next font changer app is called Fonts for FlipFont Romance. To change fonts on your Samsung Galaxy device, navigate to the display settings in your device’s system settings. In the display settings, you can change the font style to any of these 50 new fonts for Android. This font pack should work on all Galaxy brand phones and will provide fonts for Samsung Galaxy S3, fonts for Samsung Galaxy S4, and fonts for Galaxy Note 3. This app will not work on developer devices, such as the Galaxy Nexus or AOSP Galaxy S4 Google Edition, because it does not have the FlipFont program. Please verify that your phone can change its font. Look for the font style option in the display or screen display section of your device settings. This app is not designed as fonts for android with root and does not require root permission to change your font, nor will it require you to restart your phone. * Also, you will be able to enjoy your fonts for texting and messaging, however, the typeface used on your device will not be sent to people that you send a text message to. As the name suggests, Font Changer apps are used to replace existing fonts on smartphones and tablets android. This app provides more than 60+ unique and cool fonts that you can use for free. Quiet course, this application can run on android smartphone with Root or without root. You can also check how to use creehack to download more modded aplications. In addition to changing the font android, you can also Convert text from Indonesia to a more unique and funny form. No more small talk, download free Font Changer app through the Google Play Store. The last application I can recommend is from JRummy Apps Inc. named FontFIx. This application has a very extraordinary advantage that is different from other font changer apps. 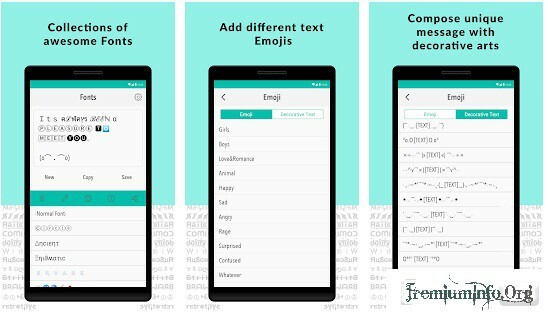 FontFix application provides over 4,300 fonts that you can all use for free to beautify and enhance your android look. Take it easy, this app can run on android phone with root or without root. But it would be better to get optimal performance, do root first. Unfortunately, with unique and cool features, this app can not run on Samsung Galaxy S7. That’s a brief review of Some of The Best And Free Font changer apps for Android Without Root, hopefully, it can be helpful and useful. All the above applications you can download directly through the Google Play Store. If anyone wants to ask or want to add something, write it through the comment field below.